Donations were received through the 2018 $100,000 Cash Lottery to support the purchase of a new Blanket & Fluid Warmer for the Emergency Department at BUH. Each year the Emergency Department (ED) at BUH receives over 25,000 patient arrivals and some of these are trauma related. Trauma patients often experience hypothermia from their injuries. Hypothermia is a condition when the body loses heat faster than it can produce it. This can cause a dangerously low core body temperature, further compromising the patient's condition and recovery. In order to prevent this, patients are wrapped in warmed blankets and IV fluids administered are warmed. This not only provides comfort but aides in a faster recovery. 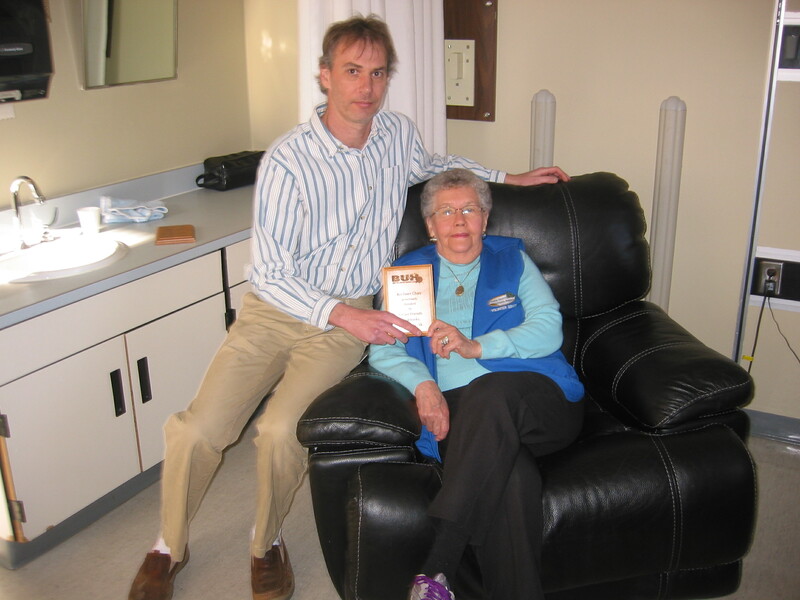 BUH Foundation purchased a new lift recliner for patients within Palliative Care. The need was expressed for a chair that would allow patients to sit comfortably and assist them in standing up. Current recliners were suitable for visitors, but too soft to meet the patient’s needs. Within a day of this request being made for a patient, the chair was in place and was being used. The Women's Health & Birthing Centre (WHBC) is pleased to have six new Champion Sleep Chairs at BUH. The sleep chairs are specifically designed for overnight visitors in hospital rooms and will be used in the rooms of new moms. The WHBC promotes a family centred environment and encourages the partner to stay with mom and babe and learn how to look after their new baby together. The sleep chairs will provide a more comfortable place for those who stay overnight as they welcome their new baby. WHBC is kept busy and delivers over 500 babies in a year. North Battleford Comprehensive High School (NBCHS) Senior Girls’ Viking Basketball Team raised $12,708.49 for the chemotherapy department at BUH through the Hoops for Hope ‘Pink Game.’ The Hoops for Hope is a great challenge for teams where a different team in the league is challenged each year to raise funds and support a local charity of the team’s choice. We are grateful to NBCHS Senior Girls’ Viking Basketball Team for choosing the Foundation and helping to purchase two new heated treatment chairs for chemotherapy patients. BUH’s chemotherapy program runs five days a week and provides care for 225+ cancer patients, which is over 1700 treatments. New, heated chairs will help to make these treatments a little more comfortable. Through donations raised during the $100,000 Cash Lottery, three new patient treatment chairs were purchased for pre-op in the OR. Over 3,100 surgical procedures are performed every year and the previous chairs were worn out. The special feature of the chairs is that they recline into a full Trendelenburg position, which puts the patient's feet higher than their head. This is the first-line intervention in the treatment of very low blood pressure and/or shock, and is considered life-saving, combined with proper treatment. This is important in pre-op where patients can be worried or nervous. Also shown in the photo are mobile dividing walls, purchased through funds donated to the Foundation. These simple walls allow for a measure of privacy for patients going into surgery. The Foundation has supported many purchases within the cataract program at BUH to help enrich the care being provided. 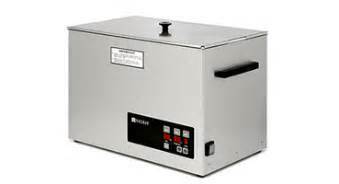 Recent purchase includes an Ultrasonic Cleaner with basket to ensure that the new Ozil Handpieces and delicate instruments used in cataract surgeries are protected and not hitting each other during the required sterilization process. We are pleased to support this purchase to extend the life of the instruments used and provide quality care at BUH. The Foundation is pleased to support the purchase of new, up-to-date medical equipment for the new Ears Nose & Throat (ENT) specialist within The Battlefords. ENT specialists treat children and adults and diagnose and treat conditions of the ears, nose, throat, head and neck. The Battlefords have been without an ENT specialist for two years and required new surgical instruments, drill system, microscope and a nerve monitor to meet current standard of care levels and to provide the best care possible for our family and friends. The addition of the ENT specialist within The Battlefords will allow many families to receive medical treatment closer to home, with reduced travel time, expenses and waiting lists. 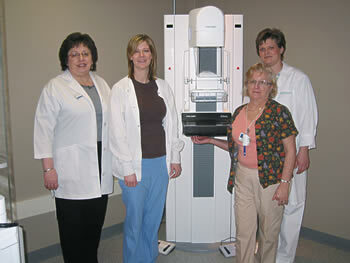 The Foundation committed to fund $600,000 towards the purchase of a new CT Scanner for BUH. The previous unit was over 10 years old and had reached its end of life. This is a significant purchase for BUH as the CT Scanner is used regularly for diagnosis and is a vital unit to have available within the community. CT Scanners aide in the diagnosis of diseases such as cancer, cardiovascular and infectious diseases and injuries, including internal injuries from car accicents or other types of trauma. The new CT Scanner has a lower radiation dose for patients, and has an increased number of "slices," which means sharper, clearer, more detailed images that are acquired faster, making scans easier for patients and helping to provide a more accurate diagnosis. Thank you to everyone who supported this purchase. An iPad with apps was purchased to be used as a learning and communication tool for speech therapy clients, 18 years and older at BUH. Currently, clients at BUH only had access to a picture or alphabet board, which limited their communication and learning. The iPad and apps will increase their ability to communicate by having apps that can do more than a picture board can. We received a thank you note from the Speech Language Pathologist extending her appreciation for investing in this tool to enrich the lives of her clients as she has already been able to use it to demonstrate therapy ideas and to trial methods of communicating. The generosity of donors during the 2016/2017 Monthly Lottery allowed for not just one, but two syringe pumps for use in C-sections to be purchased. 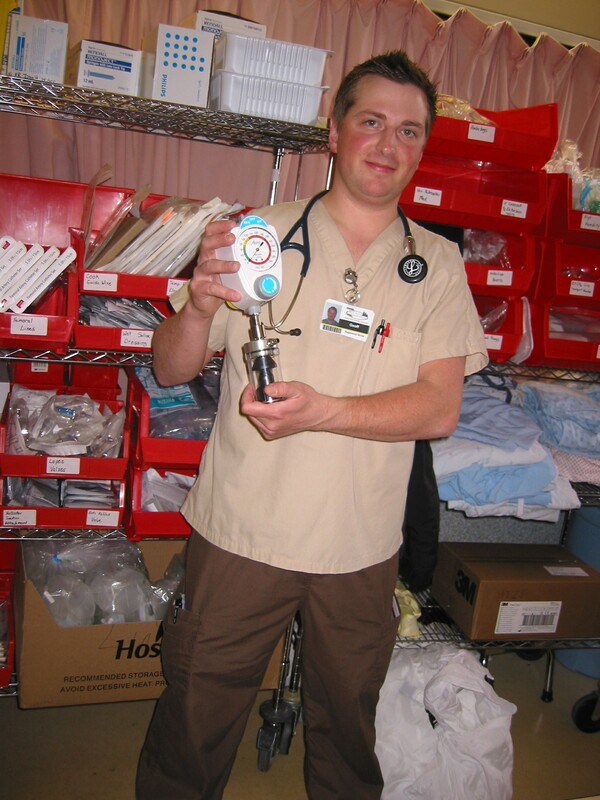 A syringe pump is used to deliver the IV medications and fluids at the very accurate and metered dosages and rates required. This purchase will allow for continued safe and effective care for mothers and babies within our community. The staff and patients within the Chemotherapy department are grateful for the new Blanket Warmer and two new vital signs monitors purchased through the Foundation. 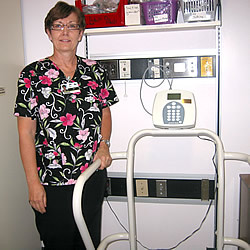 Vital signs monitors are used to measure a patient's heart rate, blood pressure and temperature. This allows nurses to know if a patient is stable or if they are in distress and medical intervention is required. 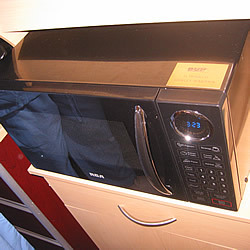 The new Blanket Warmer ensures there is always a warm blanket to comfort patients. Chemotherapy treatments can last up to five hours and patients can be cold and uncomfortable during this period. Something as simple as a warm blanket can make a big difference. The Blanket Warmer was purchased in part through donations made in memory of Phil & Gary Boskill. Through donations received towards the Palliative Care department, the Foundation is honoured to be a part of a new Family Conference Room on Third Floor. It was noted by families that there was not a comfortable, private location for families and patients to discuss their care, so a room was made availabe but required furnishings to make it comfortable. Through the generosity of donors, the Foundation was able to support the purchase of a table and chairs and cabinet and help provide an appropriate space. 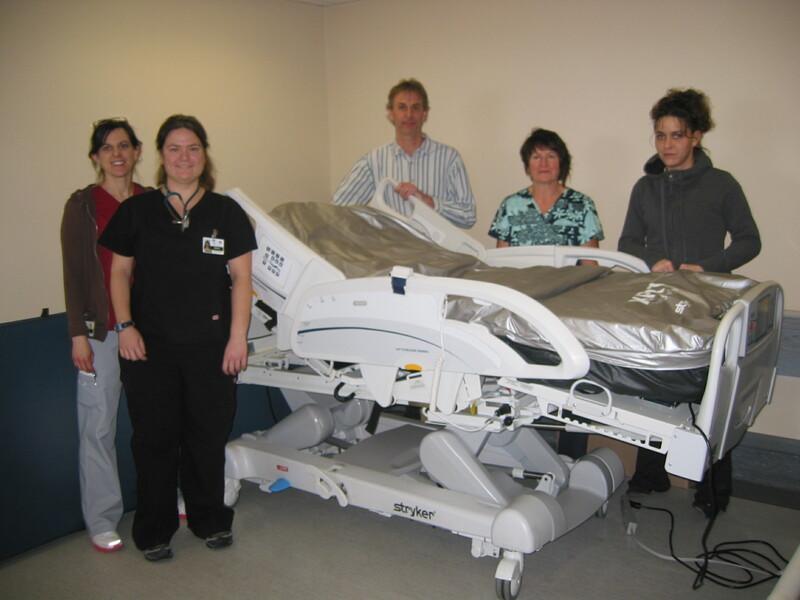 A new Interferential Therapy Machine was purchased for BUH’s Physiotherapy Department. The Interferential Therapy Machine is an effective and non-invasive therapy option to relive pain and accelerate the self-healing process through interferential current therapy. Many of the patients at BUH’s Physiotherapy Department have medical conditions associated with chronic pain and/or inflammation. The Interferential Therapy Machine is extremely useful in reducing pain, inflammation, reducing edema and spasms. It does so by transmitting electrical impulses in minute quantities through the skin. The frequencies produced are proven to stimulate nerve fibers to produce an analgesic effect and create a self-healing process without the need for medications. New OZil® Handpieces for cataract surgeries have been purchased. BUH performs about 800 cataract procedures every year. They help patients regain their sight to read, drive and see their grandchildren again. Procedures are performed on a weekly basis and the OZil® handpieces, used to break down the cataracts, require sterilization between uses. Therefore, in order to see the maximum number of patients each week, a full set of OZil® handpieces were required, and has now been met. 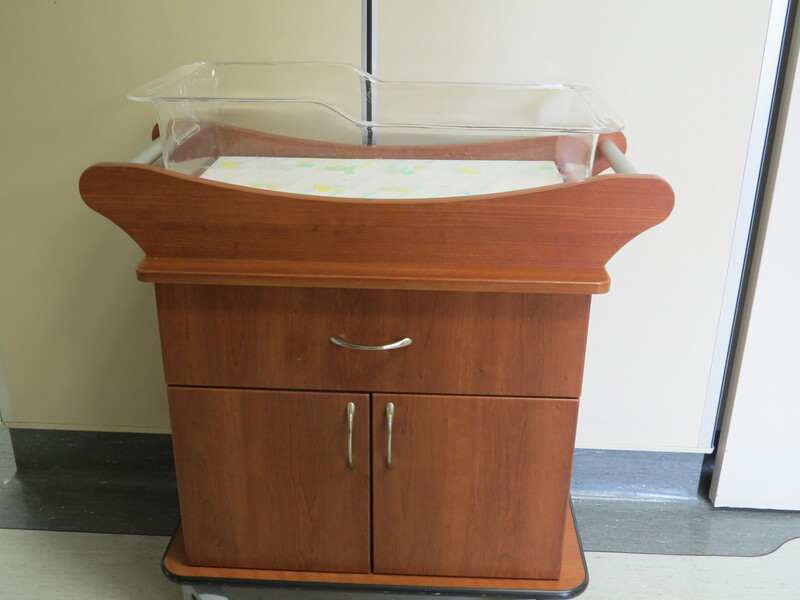 Four new bassinets were purchased for Women's Health & Birthing Centre. The bassin ets provide a safe and comfortable environment for the infants while providing maximum visibility of them. The cabinet underneath is available for diaper changing needs and other necessary supplies and the bassinets can be easily wheeled between nursery and mother’s room. The new bassinets are replacing the aging units previously in use and we know families will appreciate these wonderful new purchases. BUH Foundation is grateful to BATC Community Development Corporation (BATC CDC) for supporting the purchase a SimBaby package. This package consists of a mannequin that simulates a baby under 12 months and the medical equipment to practice real life scenarios on it. The SimBaby will provide training for routine care and critical emergencies for the first and second year students of family medicine at BUH, as well as doctors and nursing staff in the Emergency Department, Intensive Care Unit and Obstetrics. This additional asset in the Education Lab will allow staff to practice and perfect their skills in a risk-free environment and ensures well-trained, confident staff is available to provide the best possible care in our community. Dr. Weston was a founding member of BUH Foundation and served the members of The Battlefords for many years. 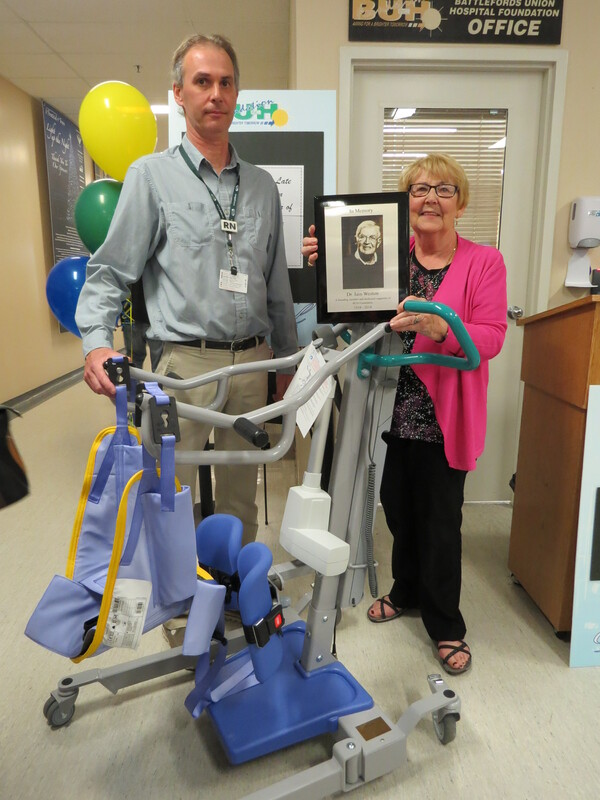 In June 2014 Dr. Weston passed away and donations were made in his memory for a new Arjo Sit-Stand Lift for Battlefords Region Home Care’s Adult Day Program. A Sit-Stand Lift aids in transferring clients from their bed to a chair or to the bathroom. 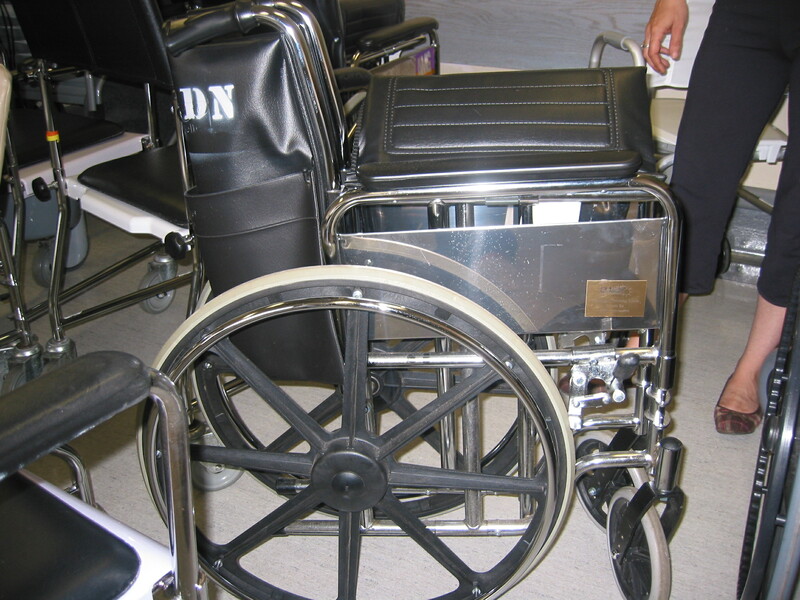 It is designed for a safe and comfortable transfer for both the client and the caregiver. It allows transfers by one caregiver for bariatric patients, rather than two or three, making it much more comfortable for the client. The addition of the Sit-Stand Lift to the Adult Day Program will allow clients requiring a higher level of assistance to continue to attend the program. Battlefords Region Home Care (BRHC) has an average of 150 visits per month for numerous types of treatments and therapies that can take ten minutes or a couple of hours to complete. They comfort level of these visits was substantialy enriched with the purchase of a new Medical Recliner Treatment Chair. This chair replaces the office chair that was being used and provides simply features, like reclining with a footrest and a sidetray, that make changing of dressings or IVs much more comfortable for both patient and healthcare provider. The Operating Room (OR) at BUH is pleased to have received a new GlideScope Titanium Laryngoscope System from the Foundation. 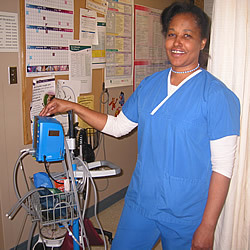 A GlideScope System assists in rapid intubation of patients when needing to insert breathing or nasal gastric tubes for surgery. The new System includes pediatric capabilities that weren’t available on the old unit, but had to be borrowed from the Emergency Department. The OR at BUH sees approximately 270 surgical patients in a month and many of them will benefit from this new purchase. 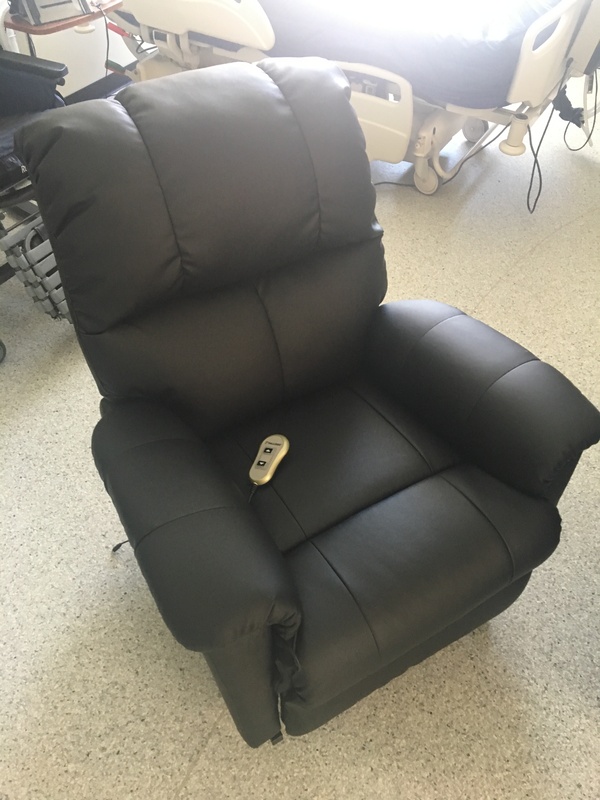 New, heated recliner chairs have been purchased for the Chemotherapy and Renal Dialysis departments at BUH. These chairs provide enriched comfort and warmth for patients during what can be a difficult time. Treatments can last up to five hours and patients can be cold and uncomfortable during this period. The addition of two chairs for each department, at this time, means patients can receive enriched care to provide whatever added comfort is possible. Throughout the year, donations received buy various pieces of necessary medical equipment that provide enriched patient care to our community. These pieces are under $3,000 and may be small, but the difference they make to care provided is big. 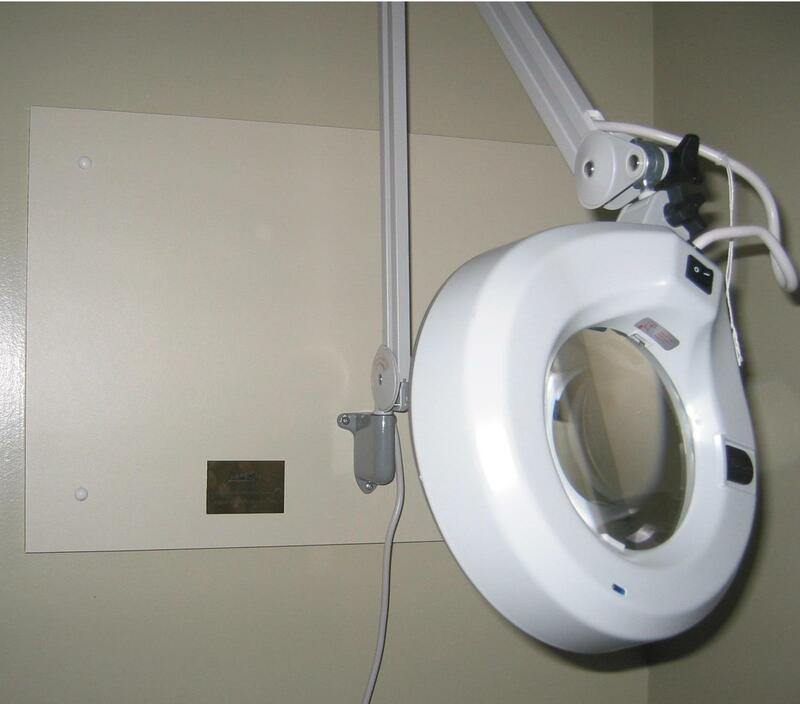 Examples include Regulators for Suction Units for ICU, Magnifier Illuminated Lamp for ER, and Wheelchairs for patient transport. The first donation of a five year pledge of $100,000 from Robert & Sandra Stromberg purchased a Vein Viewer, to be used in any department at BUH. Robert shares, "Sandra & I have always believed in the value of community support and BUH Foundation fits our criteria of a worthy organization for our involvement. We are hopeful that our contribution will be the catalyst for similar support to local healthcare at BUH." The Vein Viewer uses near-infrared light and other patented techonologies to detect subcutaneous blood and create a digital image of the patient's superficial vein pattern, projected directly onto the surface of the skin in real time. It helps to reduce the time to start an IV and to reduce the number of attempts to start an IV. It can be used for patients with small or hard to find veins and help to make them more comfortable. Funding received from BATC Community Development Corporation and Innovation Credit Union enabled the purchase of a new Endoscopic Tower & Processor Unit and a new Laparoscopic Tower, as well as upgrades to an existing tower, respectively. The OR Team is very pleased with these purchases and Dr. Bairagi: General Surgeon, Endo Clinician, had this to share, "As a general surgeon and Endoscopy Clinician, I am very much aware of the improvements made at BUH with the recent equipment inventory both in Endo and Lap surgeries. The entire BUH team is grateful for the financial support we receive every year from the Foundation and our community to make this equipment possible." With the support of the generous contributions of the community, including Battlefords Wildlife Federation, Royal Canadian Legion Branch #9, and the employees of Prairie North Health Region, BUHF was able to purchase Crash Carts for ER, ICU, OR, 3rd Floor Medical, and 2nd Floor, including Women's Health & Birthing Centre & Surgery. Crash Carts are used in emergency situations to transport and dispense emergency medication and equipment for life support protocols to save someone’s life. The new carts will ensure that each cart is stocked with the various emergency equipment and medical supplies needed and will help to create uniformity within departments so that no matter where the emergency occurs staff will be trained and ready to assist. The Palliative Care Program is pleased to be a receipient of a donation from Breast Friends. Breast Friends has raised over a million in donations through the sale of their cookbooks (which are available in the BUH Foundation Canteen & Gift Shop and help to support our own Breast Health Fund & Oncology program). Proceeds help to raise awareness of cancer and Breast Friends give back to many community projects to help make a difference in people's lives. We are very grateful for their contribution of a new leather recliner for a Palliative Care room as it enriches the comfort of family and friends. Shown in photo is Scott Parker, Palliative Care Coordinator, with BUH Volunteer. The Palliative Care Program received a new bed for one of the rooms due to the generosity of many individuals as they gave in memory of their loved ones. Through the support of the community and surrounding area an Advanced Therapeutic Support System was purchased to assist in providing safe, comfortable, preventative therapy. With features such as an low air loss and powered pressure redistribution mattress to provide comfort and advanced pressure ulcer prevention and treatment, as well as being able to provide both percussion and vibration therapy, this bed will help to enrich patient care. It also has many benefits to the medical staff with reminder and safety features, allows multiple position changes, even moving into a chair position, and can even speak and sing to patients. Thank you for making this purchase possible as we focus on the comfort and wellbeing of our family and friends. Due to the generosity of patients who received cataract surgery at BUH the Foundation was able to help purchase complete cataract kits for the surgical department. These kits contain the necessary tools to complete a surgery. Over 600 cataract surgeries were performed in the last year, with many reports of how wonderful the nurses and doctors were. 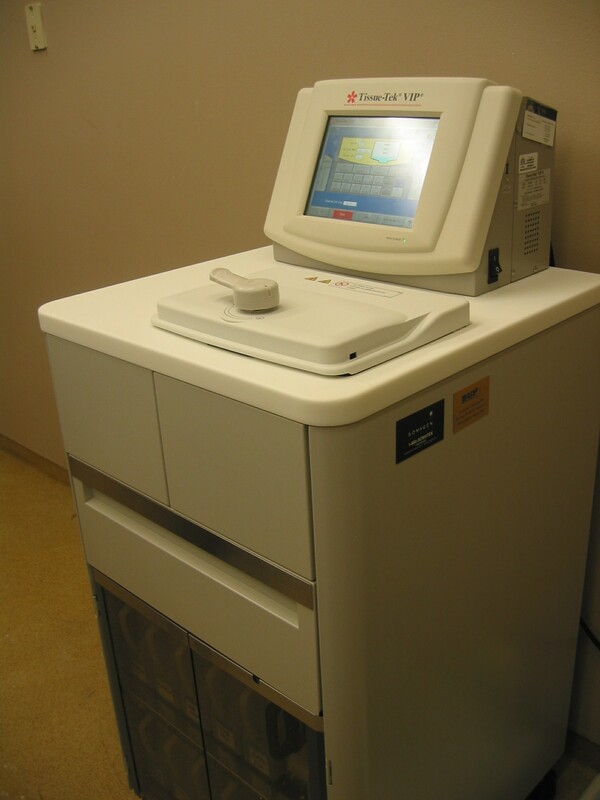 Through the support of BATC Community Development Corporation, BUH Foundation purchased a new Tissue Processor for the Pathology department in the Laboratory to replace the current unit that was outdated. A tissue processor is an instrument that processes various tissues and aids in the accurate diagnosis of cancer and other diseases. This new processer can allow for more specimens to be processed and is much safer, securer, more environmentally friendly, and allows for a better sample to be reviewed by a pathologist. With approximately 25,000 pathology specimens processed in a year, this instrument will be important to the laboratory’s operations as they aid in the diagnosis of disease. 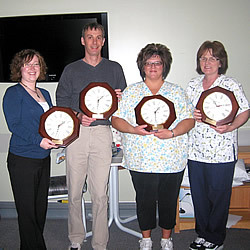 New Clocks were purchased for all four of the Palliative Care rooms in memory of Doreen Pierce. 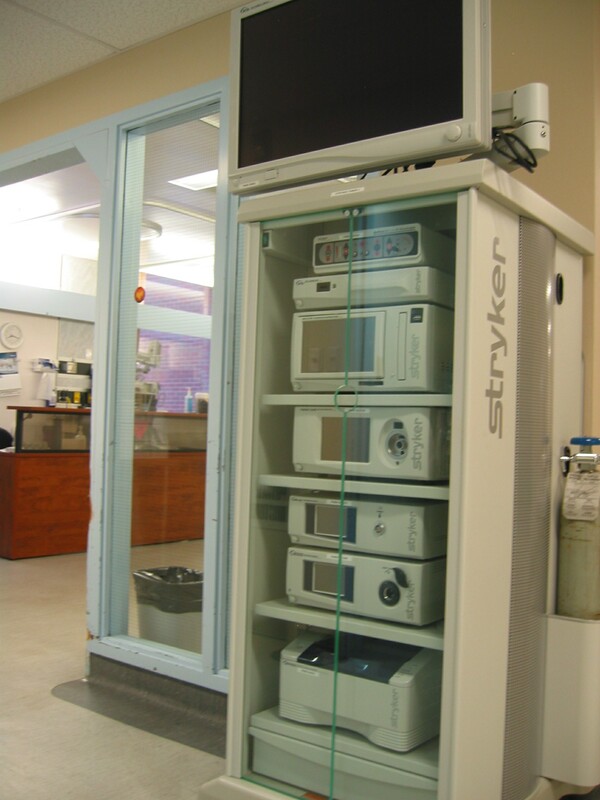 A new microwave was supplied for a palliative care room in memory of Shirley Warwick. A new Blood Pressure Monitor for ER. A new Platform Scale for 3rd Floor Medical. 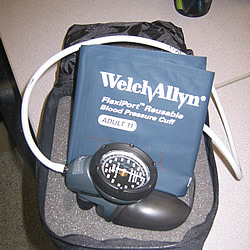 A new Manual Blood Pressure Gauge for ICU. 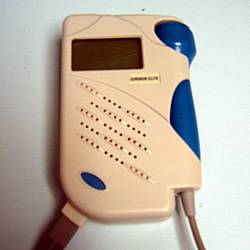 A new Fetal Doppler for Women's Health & Birthing to monitor the fetus' heartbeat for prenatal care. "The quality of care patients receive in the physiotherapy department has been enhanced by the assisted purchase of a new inferential unit. The inferential unit is a machine that is used every day in the department to assist in a patient's recovery after an injury or disability. It's used to decrease swelling, pain, and muscle spasm and improves circulation. 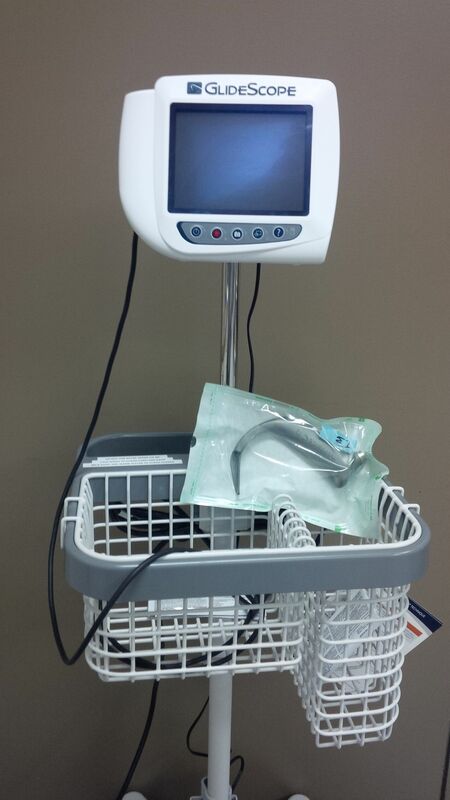 With this new purchase we can offer the treatment to more patients, eliminate wait time, and are now confident this treatment will still be available when the older machine quits working." ~ Cherie Illingworth, Physiotherapist. 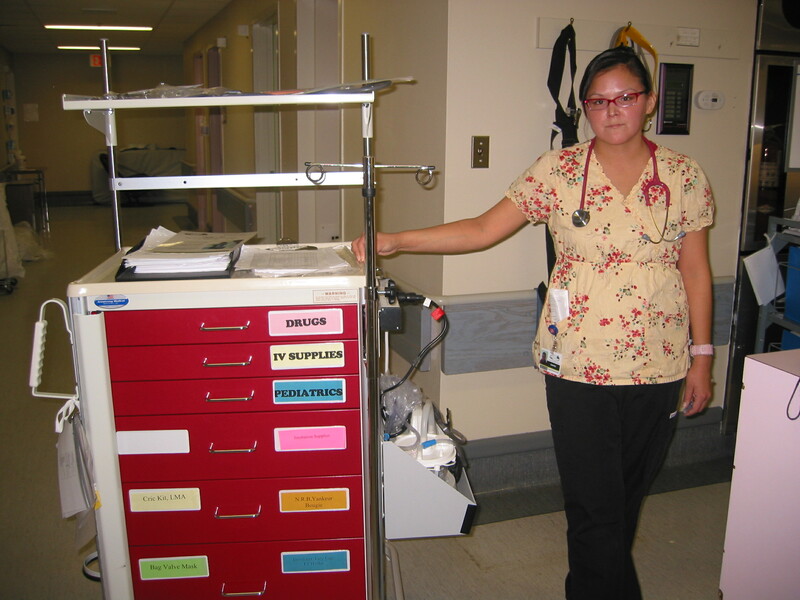 "BUH Foundation has provided tremendous support to the healthcare team in the Emergency Department (ER). I would like to express our gratitude for the opportunities to access financial support for further education that have enhanced significant learning opportunities within the ER. The knowledge gained through on-going learning has made us a stronger team and enhances the quality of care that we as professionals are able to deliver to the people of our community. 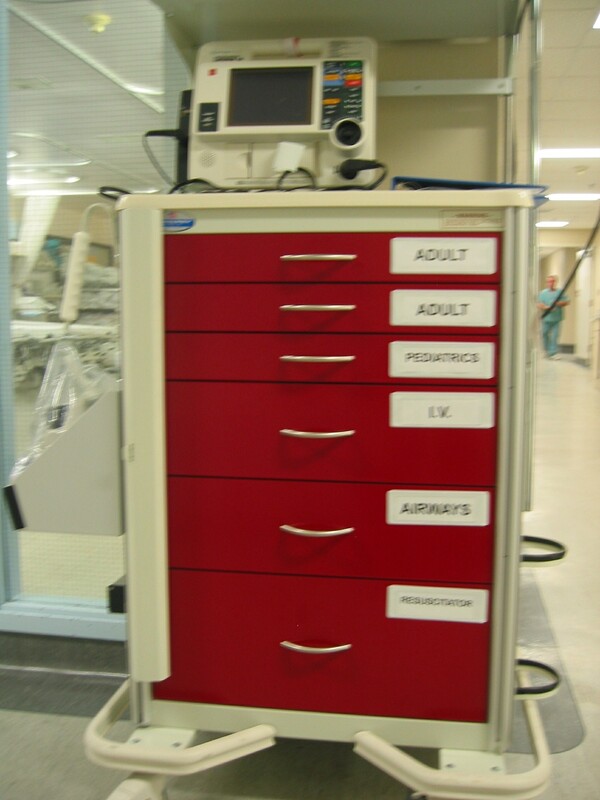 We have also received the recent purchase of a Premier Broselow ColorCode Cart System allowing the healthcare team in ER to proceed with the care of infants/children in an organized manner, utilizing equipment that is specific to their needs." ~ Shelly Horsman, Nurse Manager, Emergency. 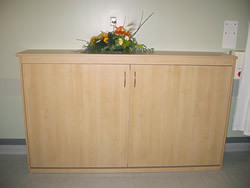 The four Palliative Care rooms at Battlefords Union Hospital are now fully furnished with Murphy Beds. These compact units were purchased and installed to provide family members and friends of Palliative Care patients a comfortable option during extended stays, while still allowing physicians and nursing staff easy access to patients. 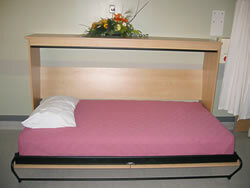 The beds were purchased through donations received in memory of loved ones who were cared for on the ward. Battlefords Union Hospital recently upgraded the Radiology Department with the purchase of Hologic Selenia Full Field Digital Mammography equipment. Fully installed and operational the last week of February 2008, this equipment allows the technologists to perform advanced diagnostic mammography in the morning and breast screening in the afternoon. The Foundation office raised $450,000.00 towards this much needed equipment purchase through the Breast Health Fund Campaign. 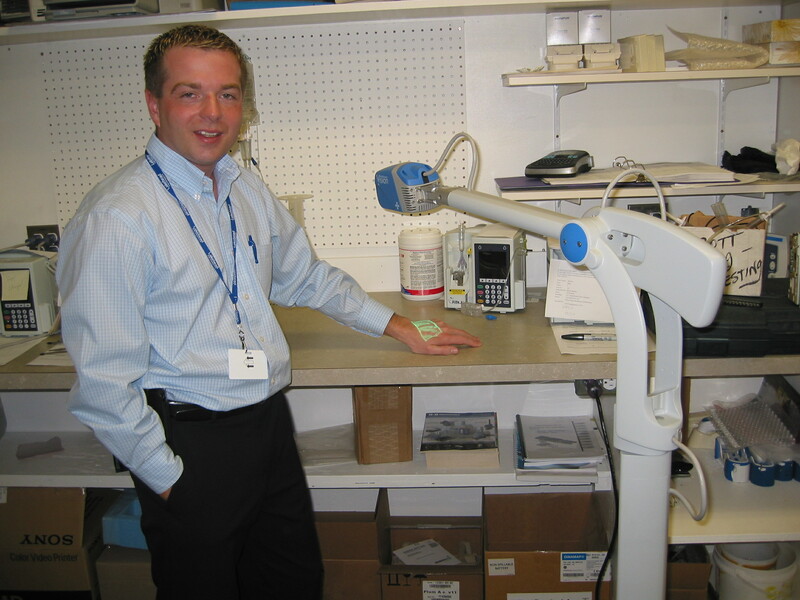 Proceeds from the 2007 $100,000 Cash Lottery along with a $100,000 contribution from BATC CDC were allocated towards the purchase of new automated, integrated chemistry system formally known as the Roche Cobas 6000 system, for the Lab at BUH. This equipment will assist lab personnel to test up to 600 blood samples per hour, which is a significant increase over the current rate. This new equipment also enables BUH Laboratory staff to keep up with the technological demand to provide more types of tests than are currently available. Test results are now available within 8 -12 hours, versus one week, allowing physicians and their teams to provide better patient monitoring. A tremendous outpouring of support by the community in 2006 is now paying dividends, with four new anaesthetic machines in place in the operating room of Battlefords Union Hospital. Brett Wilson, former North Battleford resident, and now an oil executive in Calgary, challenged the community to raise $300,000 which he would match dollar-for-dollar. The community overwhelmingly rose to the challenge, raising just over $500,000, which Wilson happily matched with $500,000. "This advanced technology is the gold standard for anaesthetic monitoring in many types of surgeries," says OR Nursing Unit Manager Jacquie Baynham. But it's not just machines. Extensive installation and technical work was done with respect to a new data management system which was possible due to the additional funds the Dollar-for-Dollar campaign raised. The xray machine purchased through the donation of $160,000.00 by Brett Wilson, includes the latest technology in diagnostic imaging. It replaces the previous machine as a trauma unit and with its auto tracking capabilities, benefits both patients and staff. 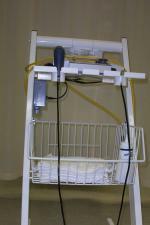 The xray is fully adjustable for people of different heights, from children to adults. The new machine, with its supporting equipment and software moves BUH closer to a filmless environment. In time this will mean that xray films are no longer printed and will be maintained on computers. This piece of equipment enables staff to produce images faster and with less stress to patients involved in a car accident or similar trauma. Patients and staff will also be saved from exposure to radiation as staff will be able to take one picture, and produce two separate images. The new technology also provides an interactive module. Protocol has been established and input into the software which provides the approved standards for diagnostic imaging. Bernard Franz of Meota and Al and Caren Baert of North Battleford have generously donated funds to BUHF to purchase endoscopy equipment for Battlefords Union Hospital. Bern Franz donated $100,000 in memory of his late wife, Bertha, who died of cancer in the fall of 2001. Al and Caren Baert, grand prize winners of the 2003 BUHF cash lottery, donated $10,000 of their winnings back to the Foundation. Endoscopy is a screening procedure for cancer. A gastroscope or colonoscope is used to visualize sections of the gastrointestinal tract. The equipment can also be used to diagnose the causes of heartburn, acid reflux, swallowing problems in the esophasgus, ulcers, tumors and polyps of the gastrointestinal tract. The client is secured onto a horizontal table, then slowly raised as vertical as they can tolerate. The client can rehab in standing much earlier, even if they need full support. This table is used to achieve a standing position in those clients who have been on bed rest and are too weak to stand up even with assistance. Indications: Stroke patients, spinal cord injuries and sudden weakness limiting a patient to bed rest. This item was purchased by the North Battleford Bonaventure Lions Club's 2003 Art Auction and general donations. This is an arm bicycle. This is a popular physiotherapy tool to improve cardiovascular fitness and upper extremity muscle strength. It is necessary for patients that can't walk and/or use their legs to exercise. This item was purchased by the North Battleford Bonaventure Lions Club's 2003 Art Auction. Physiotherapists use this machine to deliver low frequency ultrasound waves to an injured body part. The ultrasound causes thermal effects (deep breathing), vasodilation (dilation of blood vessels), acceleration of lymphatic flow, hyperaemia adn a micromassage on the tissue. Indications: Adhesions (scar tissues), pain and muscle spasms, Neuralgia, Calcified tendonitis, Haematoma (bruising) and swelling. 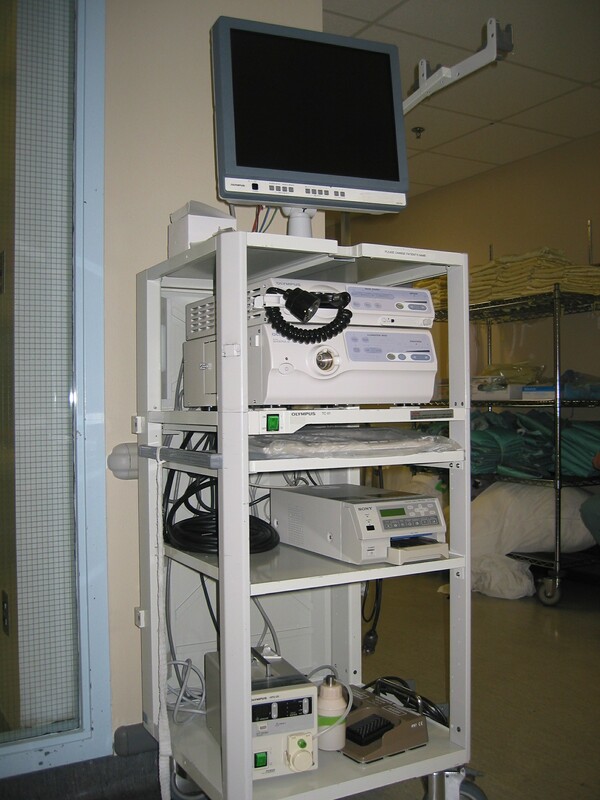 This device is used to assist in diagnosing Cardiac Conditions on an out patient basis, while allowing the patient mobility to carry on with day-to-day activities. When the patient feels symptoms that could be Cardiac related, he or she presses the record button. The data is downloaded by telephone to a Cardiac Technologist for interpretation and results are forwarded to the physician. Previously anyone needing such a device had to wait for one to become available from a Saskatoon Hospital. Picks up the Fetus's heart in the womb from 11 weeks to full term. Assists in assessing babies heart rate. 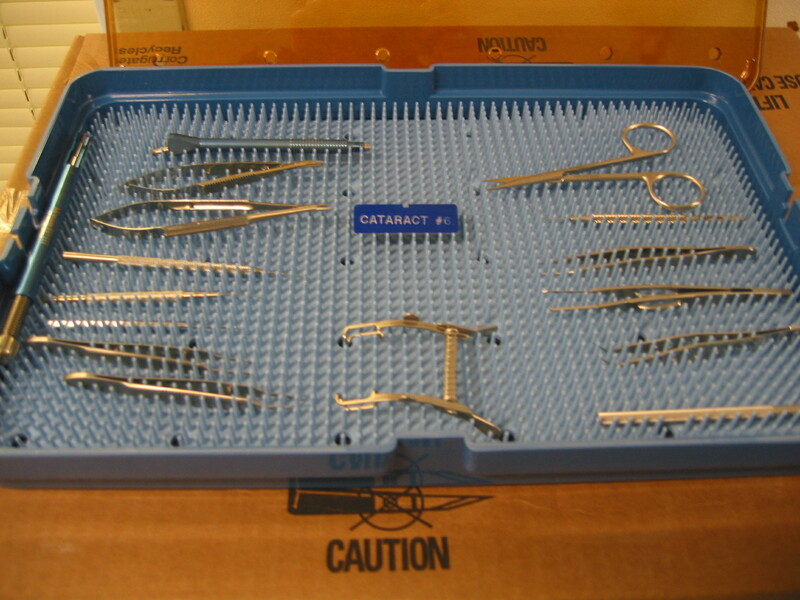 Used to store sterilized surgical tools for dental surgery.